Is it every man's dream to own a brewery? Maybe. But as nice as it may sound, the reality is a task and a half, and few men could muster the necessary patience and commitment. In fact, few would would want to get to work at 4 am to start the brew process, and few would have the audacity to bore a hole 45 metres into the earth in the hopes that they might find a good source of spring water, but with no guarantees that they would. Josh Dunkley is one of those few, and Cornish Crown is his brewery dream come true. 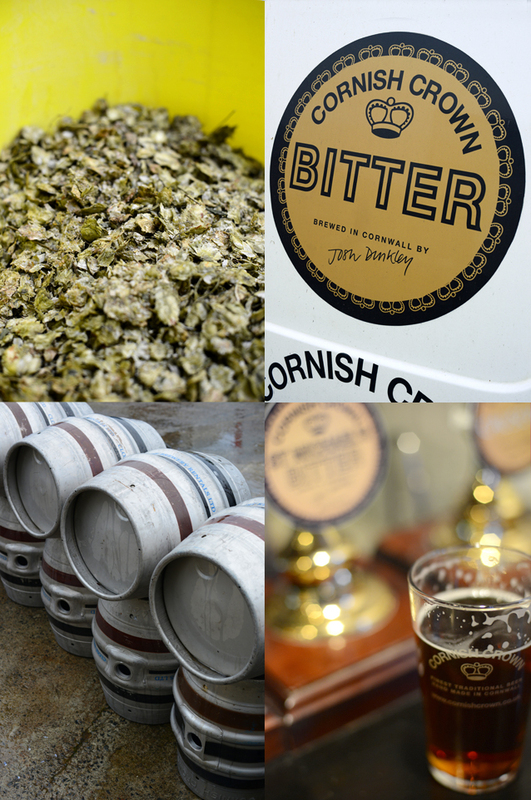 Now, as we meet Josh a year into the life of Cornish Crown, the operation looks well organised, the beer is selling and the business is bubbling along nicely. But it's been a long journey to get here. Josh's brewery plan had been in the pipeline for years; having successfully run The Crown on Bread Street with wife Michelle, he regarded starting up his own micro-brewery as a natural progression. But it was a long-term vision; starting any new business takes time, but to learn a completely new skill to be able to start that business, takes a while longer. Simply loving beer is a good starting point, but there's a science to be learnt and mastered before that first pint can be poured. First off, Josh took a basic course in brewing skills at Brewlab (yes, there is such a thing as beer college), and then he blagged an unofficial apprenticeship with his friends the Otter Brewery in Devon. He also received a lot of help and advice from other local brewers. Josh explains that in the last few years a seriously competitive micro-brewery scene has developed in the area; the rise in popularity in real ales is seeing a general boom in the industry. Once up to speed, Josh looked for premises. Uncannily, the site Josh found, over at Badger's Cross, already had planning permission for a brewery. The landlord himself had once had that same dream, but never saw it though. The premises were ideal, and offered plenty of room for expansion. Then came the question of water. Because the brewing process involves so few ingredients, each one must be of the highest quality. Water is one of those key ingredients. Josh was dubious about using mains water; not being able to rely on its source and quality meant, ultimately, that he had less control over his pint. While most brewers see this as an acceptable risk, Josh had other ideas: he wondered whether he could tap his own spring. After a bit of asking around there seemed to be evidence of 'potable' water in the area. But this was no guarantee; the whole project was a gamble. To access the water, he'd have to drill down, how far was impossible to say, and even once water was struck, it's quality could vary wildly. Even a bore hole specialist warned Josh off the idea. Nevertheless, bore he did, and at 45 metres he struck water. Putting it through just a simple sediment tank, a micron filter and UV, he has an unlimited supply of pure spring water for his beer. The system will pay for itself in a year and a half, and after that it's free. Brilliant. 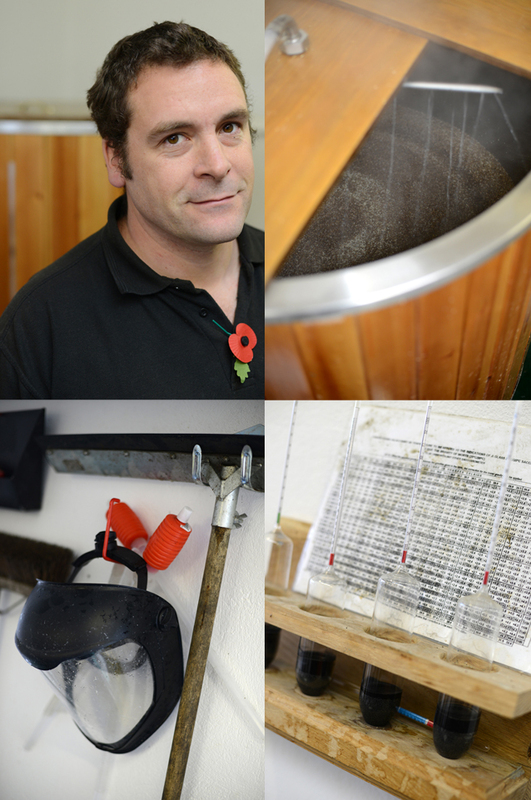 Josh gave us a brief guide to the beer making process. It's actually quite complex, and the terminology had us foxed, but it was clear that his real passion lay in the creative bit: the balancing of ingredients and processes that makes one beer different from another. With so few ingredients to play with, these differentiating factors are pretty subtle. He explains that two of the key variations are 'hoppiness' and 'maltiness', and the degrees of these could make an 'IPA' at one end and a 'mild' at the other, with umpteen other beer varieties in between. For the record, Josh's personal taste dictate's that Cornish Crown beer's err on the side of 'hoppy'. There are currently five coming out of the brewery: Cornish Crown Ale, Cornish Crown SPA, St. Michael's Bitter, Causeway, and most recently, Merry Mild. Josh likes to involve his customers in the development of the beers and holds monthly Beer Club where new ales are sold for a £1 a pint, and are duly supped, considered and commented upon. Josh tries to bring out a new beer every month. Response from customers has been positive, and Josh now supplies to total of 40 businesses, although, surprisingly, he actually sells more beer out of the county than he does within it. He tells us that this is because of the fierce (but friendly) competition down here, and because many pubs are tied-in to larger breweries. However, in London it appears they love anything Cornish, so Cornish Crown goes down a treat. In fact, Josh's decision to include the word 'Cornish' in the title was part of his cunning export strategy all along – Josh studied advertising, and it's clearly paying off now. Josh and Michelle lived in London until 14 years ago, and Josh once managed the renowned Landsdowne pub in Primrose Hill. His erstwhile contacts in the capital are now his lifeline, but there's nothing wrong with that; outside money coming in can only be a good thing. Josh once had plans to open a bottling plant next door, which would have increased his export potential massively. But the necessary investment in both cash and time was a step too far, and sensibly he reined in his ambitions before he endangered the whole business. So, instead, he's taking it slow and keeping things manageable. He currently has a '6-barrel' plant, with plans to expand to no more than a 30-40 barrel operation within around five years. And apart from one employee, who helps with the brew one day a week, Josh does everything himself. This is indicative of his controlled approach; like a good beer, he knows that the making of a good brewery can't be hurried, it has to mature over time. But already, after just one year, his achievements are worthy of high praise – it's a local success story, and for that he deserves our loudest cheers.